If you’ve been waiting for a deal on invisibleSHIELDs and other ZAGG accessories, the time to buy has arrived. 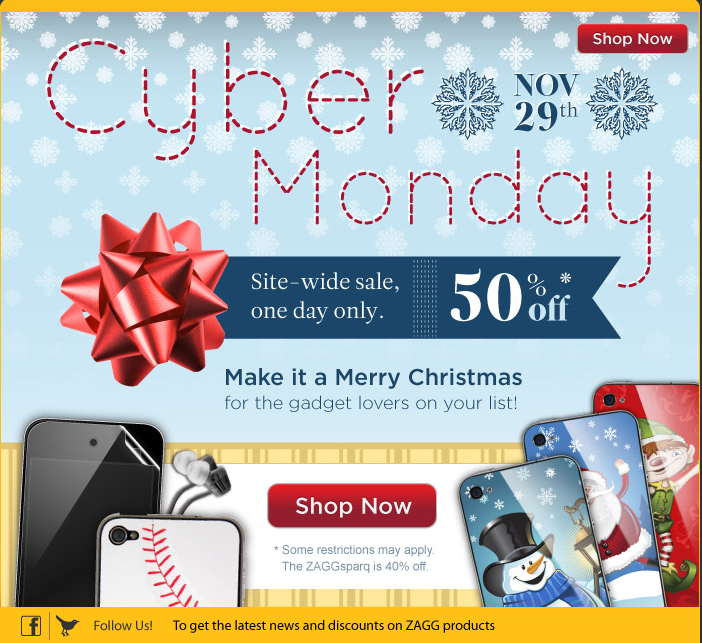 ZAGG is holding a huge 50% off site wide one day Cyber Monday sale. It applies to everything on the site (40% off the ZAGGsparq–read our review below). The 50% off sale is live now thanks to Mountain Standard Time–act now so you don’t miss out! These half off sales only occur 1-2 times a year! Also, if you retweet/share this deal, you’ll get free pack of ZAGGwipes with your order. Happy shopping!